After my operation in 2002, I was determined to help others. I set up this site, I wrote articles and I researched and read a lot about how Heart Surgery and other life threatening injury or sickness, affects patients and families , both mentally and physically. I was approached by the Heart and Stroke Foundation of South Africa , to assist and work with them , their Mended Hearts Program and their patients. Since then I have assisted them with Television Shows, Videos and in other capacities, to HELP, INSPIRE and motivate patients facing hardship, depression and recovery. I talk to patients, visit hospitals, chat to families and help where I can. let me know if I can help you? I first heard of you from my cardiologist, DR AD Horak, and then in discussion with my brother (Richie Bowman)– who pointed me to your blog. Thank you so much for all the reading, it really is helping my family and I prepare. I am a 36 year old Capetonian, living in Lakeside, mother, wife, (and full time employee in the financial services). I have a congenital bicuspid valve and had a narrowing of the aorta. The Aorta was corrected when I was 1 yrs old, and attempted a repair on the aortic valve when I was 4. It has been leaking moderately since. Fortunately I have had AD Horak as my cardiologist since I was about 17, so in very good hands; going for check-ups every year or two. I had a spout of Endocarditis when I was 19 (nothing compared with yours) and , although I was very bad at the time, AD managed to kill it successfully and no long term degeneration. Everything was going great, had my first son in 2010 and no negative impact. Then when I was about 7 months pregnant with my second son I started to feel run down and breathless (January 2013). At this point the baby’s growth also slowed and I was put on bed rest, thinking it was nothing more than the pregnancy and Asthma. A few days after leaving hospital post his birth I was readmitted to hospital, for “Asthma” which was not responding to any of the Asthma drugs. After running all the tests available in Constantiaberg, I was diagnosed with Cardiac failure and my mitral valve was now also leaking. Unfortunately AD was only brought into the picture very late in the process as they didn’t seem to think it was cardiac related at first. Diuretics helped and I started feeling much better, and still am feeling fine. Thereafter we hoped that things would regulate once my body adjusted post pregnancy. Unfortunately a scan 3 weeks ago, followed by an angiogram, confirmed that both valves are leaking considerably and both valves need to be replaced within the next month. It all takes a bit of getting used to, especially since I have 2 lively sons – a 3 yr old and a 9 month old surgery !! I am very interested in your experiences and time post the operations, especially around. I read into your blog that you were very well aware of the contraindications of Warfarin and therefore opted for the Ross procedure, for the Frist operation. Unfortunately this did not work and you went with mechanical valves the second time around. Did you review the options of using a tissue valve at this point ? or was it recommended not to go this route or wasn’t it an option given the infection ? I am seriously considering tissue valves, and had discussed it with Dr Horak. Obviously standard medical advise, given my age, would be to use mechanical. This is also the Surgeon’s standard response. But I am not keen on the idea of Warfarin. It is going to be interesting times ahead. My surgery is booked for 19 November. Recovery is going to be pretty difficult with my two little boys, but fortunately my mom is going to move in and help care for them. A very hand on daddy in my husband and we have an excellent nanny. So hopefully the boys will be distracted. Any other advise around the preparation and recovery will be welcomed. Thanks again for all your invaluable information. Can’t believe it is nearly a week since we spoke, and Less than 2 weeks to the opp. Time is just flying by, not necessarily feeling great about that. Work is crazy at the moment trying to handover.! Thanks so much for the chat last week, I really appreciated your input and chatting to someone who has been through it. You put my mind at ease and made the whole ordeal more manageable . 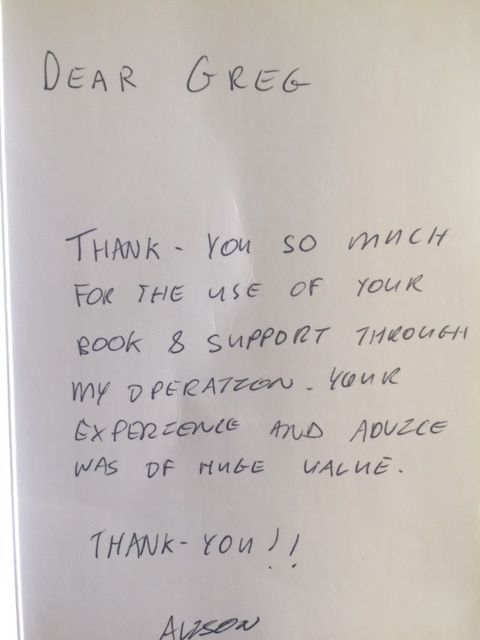 “Thank you so much for the Talk last night … Made me think about my dad and how having a full tracheotomy and learning to live a different life has made him a stronger person … Thanks Greg you are awesome !! To all those who supported me over the passed 10 years ! Especially my dear friend Miles in Aus who has really been pushing me so hard !10 years ago to the day I had my STROKE , and today I was given another life changing experience !!!! Thanks to my dear friend Greg Bertish. Once again I will be back in the ocean !!!!!!!! I found your details (and read about your experience ) from the Heart Foundation website , this is very inspirational to me !! I had my op on the 2/12/2009 , although I was “briefed” on the procedure , I never had an idea of what was to be expected …. This was a huge event that took place in my life …. thank you for your story. After having this operation , and reading other’s stories, it really puts your emotions and fears at ease. I have been on the internet the whole day looking for books and stuff to help me cope with my husband’s heart problems and his surgery. Your site is very helpful if this is new to someone. I have been through all that but as the spouse. I wish we knew about your website before hand, we would have been more prepared. Just know that it’s good to know someone else has been through this to (and personally my husband had heart failure after surgery) I feel rather alone and I do not always know how I am going to cope with this and what I could do to make it better for him. Have a nice day and may you be blessed. I am Geeta. My brother-in-law sent me a link to your website. I have just skimmed through it for now. He sent it as my mother had triple bypass surgery 3months ago. She has physically, recovered nicely from that. She had to be hosptalised about a month ago for a stomach bug which really weakened her. She is also being diagnosed with depression. Today it is cold & raining. Mum isn’t well at all. She doesn’t want to eat & her chest is very sore. Mum is sleeping now. I am the one who is at home & looks after her or tries to! Sometimes it is tough seeing her so down & out. But I try my best to keep my spirits up around her. She is 64, & my hero. It is difficult to see one’s parent in pain! Thanks Greg for your site. So much info and advice just not given anywhere else. Its made understanding and preparation of this huge event in our lives, so much easier. When Mum is awake I will read some of it to her. Thanks for indirectly helping us! My name is Sedick, i am 37yrs old and had a stent implant to a mid circumflex coronary artery on the 28 sept 02. Physically i am doing great but psycologically i was totally wrecked these past months. I must thank Joan from heart magazines for introducing two people ALAN FERGUSSON and yourselves. Only reading your experiences has made the difference. Greetings from a fellow South African! I am currently living in Dubai and read your article on iafrica this morning. I truly enjoyed the read and thought your website is really amazing. It gave me a lot to think about – myself going thru a divorce at the moment and really struggling to be positive at all times. It was just great to read about somebody that just stayed so positive in such a situation! All the best with your company and wishing you good health. (By the way, I quit smoking after reading your comment!) Wish me luck! Hi Greg. My name is Ian Klopper. My son, Adam, was in City Park in the same ward as you. I remember you coming in after surgery and watching you through your recovery over the next 3 days or so. You might remember someone giving you sports score updates from time to time, well, that was me. I am extremely impressed with your efforts of going public with your story and commend you highly for it. AS parents, we were not nearly prepared enough for it. I have a few pics of my son after surgery if you have any enquiries from parents of infants. It was a HUGE shock to see another child in the same situation that your child would be in, but I think it is important to prepare yourself properly. Let me know if you would like one or two in the future. Keep up the good work, take care.